For the best information about the Nokota Horse, visit The Nokota© Horse Conservancy and don’t miss this beautiful Informational Publication. Some may wonder why wild horses are taken out of the national parks, isn’t that illegal? Well it should be, but wild horses are actually unwanted in the national parks, no matter how strange that may seem to an average world citizen of today. Federal authorities like Bureau of Land Management (BLM) and National Park Service actually have and still consider wild horses unwanted. 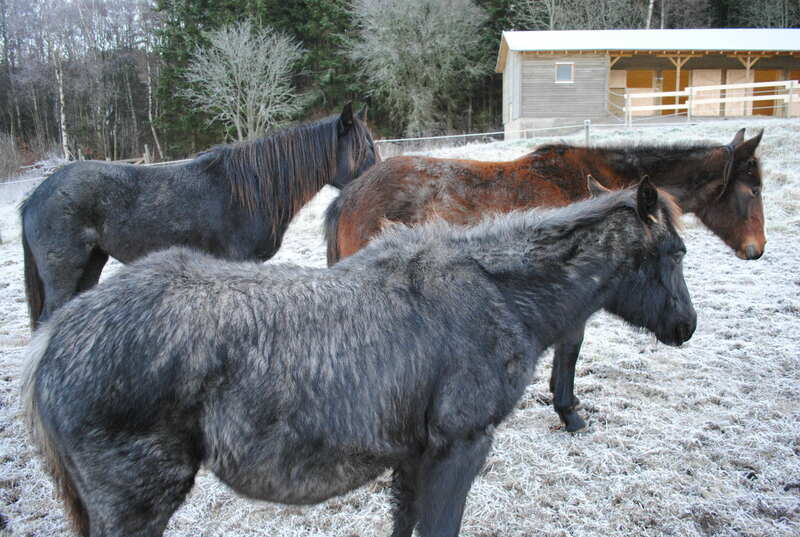 They do so because wild or native horses, are neither considered wild nor native. The arguments goes something like this; the horse came to America from Spain remember, with the European conquistadors in the sixteenth century. Besides the horses are not wild, but feral, meaning escaped domestic ranch horses, and they multiply like rabbits and eat up all the grass for the other animals. (Well that is just another false myth.) So why not remove these trespassing horses from the national parks so that we can show people how the beautiful wilderness really looked liked when the white man (or person) first set his foot in the Wild West. When the famous explorers Lewis and Clark first pushed through today’s North Dakota almost exactly two hundred years ago they did so, on “indian ponies” they traded from the Shoshone people. So the horses were already there, they had spread all over the continent, long before us Europeans ever did. But what the first visitors of today’s Theodore Roosevelt National Park did not see, was another white man, so maybe it is us who should be taken out of the national parks, not the horses. The horse originated in America several millions of years ago, they where later extinct in America about ten thousand years ago. Early humans hunting them for food were one contributing reason. So the horse roamed the northern plains ages before any man, of any color, ever sat a foot on the American continent. When the Spanish conquistadors explored the American continent in quest for gold during the sixteenth century they needed horses, lots of horses. In Spain only the best Andalusian horses were tough enough to endure the long voyage across the Atlantic under unimaginable miserable conditions. The Andalusian horse is a mixture of the Barb (desert war horses ridden by the Moors when they invaded Spain in the eight century), the Arabian full blood, and heavier European horses like the Norse dun. The amount of horses that were shipped to the new world was so substantial that the supply of horses in Spain soon became a problem and the horse breeding farms in the new world could not produce enough horses, so they turned to North Africa and began shipping pure Barb horses as well. This mixture of Barb and Arabian horses can be observed in all Spanish mustang descendants, like the Nokota. The “roman” nose is considered to be typical Barb (which I think can be seen on our Windflower Dancer) and the flat or dished face is typical Arab (which I think can be seen on our Bluebell Star), both obviously typical for many Nokotas. As the Spanish horse spread across the North American continent they changed the whole world for the Native American way of life. So now we have established the horse in its rightful environment. Now why can´t we protect them inside the National Parks. Well, unfortunately that is too late for the Nokotas anyway. In the efforts to remove the Nokota horses from the Theodore Rosevelt National Park it takes helicopters and a lot of man-hours, because the Nokotas have endured, or rather thrived, in the toughest of environments and the worst of climates for hundreds of years, they are not easy to catch. Catching wild horses costs money, so to finance the operation it can, at some point, be considered smart to try and breed in some more useful horse-blood (like Quarter, Thoroughbred, Arabian, Clydesdales etc, so the captured horses can bring in more money at the auctions. So today there are mostly good looking quarter horses left in the Theodore Roosevelt National Park. Since the last removal in September 2013 the remaining population is so severely damaged it will never recover, no original bloodlines are left. After all who wants a tiny, ugly looking Indian pony? Well a growing number of people do and we are definately in the first line! These horses are not tiny; they are extremely strong in any definition of the word. They are the beautiful descendants of the best horses Spanish money could buy, they are the descendants of the horses that the proud Lakota people cared for above life itself, and they have endured for centuries of persecution in the harshest of climates in the most remote parts of the Little Missouri Badlands in the south west corner of North Dakota. As tough and as brave as they are, they still love to meet and trust humans if they are given an honest chance. Thanks to the Kuntz brothers, the Zeigler family and many other enthusiasts that operate through The Nokota Horse Conservancy the Nokota horse still exists today. By buying up all true nokotas they could find at the national park auctions in the past and through decades of hard work they have managed to save this magnificent horse, but not by a large margin. Once less than twenty individuals, now counted in the mid hundreds. Since all efforts are based on voluntary work and donations they need all the help they can get. You can read about the Kuntz brothers, The Nokota® Horse Conservancy and about the Zeigler family on their web site and blog. Please do. Another source of information is books of course, and one of the best is “America´s Last Wild Horses” by Hope Ryden that has been revised and reprinted numerous times since 1970. My family’s small contribution is simply by being entrusted three Nokota mares and to be a part of the Nokota community, by trying to provide the best possible future for these young horses. They will grow up to be proud and skilled riding horses and give birth to new generations of pure Nokotas to expand the European Nokota bands responsibly, to serve as a backup plan for a future Nokota sanctuary in North Dakota. Very interesting article, and a worthy cause! I would love to know how you came to know about these horses. I’ve never heard of them before! They’re lovely. And lucky to have you. What a great history you wrote! And, what a lovely thing you and your family is doing! About half way through your article when you spoke of the BLM it got me to thinking about the horse that we have that we feed that lives around the lake behind us. I will post a story about Pinocchio. He is a mustang and quite a character! He is owned by the BLM and they cannot get near him! thanks for visiting my blog and liking my picture of the horses. I live in an area that is part suburban and part rural. I am surrounded by a lot of horse ranches and love taking walks and watching the horses running in the patures. I can tell from your blog that you have a great love for your horses. I wish you the best in your efforts to preserve the breed. Thanks for checking out my blog – I may not have found you otherwise! Great blog, and interesting back story. Interesting history. In some ways it reminds me of the Lipizzan horse, also a rare breed, endangered, descended from Andalusian blood. You may find it interesting to learn that the USLF is doing a genetic mare study- all horses can be traced through the mare’s mitochondrian DNA to a happlotype- ei a founding mare. I believe the European study traced all horses to 90-some happlotypes; 70 something survive to this day. Therefore, horses of all breeds would share some of these founding mares’ happlotypes. It’s very interesting. I learned that my Lipizzan-Andalusian gelding has on of the rarest of USLF happlotypes. Thank you very kind of you, take care!